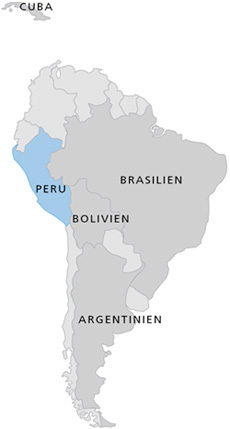 With its Pacific coastline of more than 2,000 km, Peru is one of the Andean states. It borders Ecuador to the north, Chile to the south and Bolivia and Brazil to the east. The coast, the highlands (Cordilleras) and the plains (rain forest) are characteristic of the landscape. Peru was part of the heartland of the Inca Realm, whose ruins can still be seen today. Two famous sites are the ancient Inca Capital of Cuzco as well as the ruins of Machu Picchu. In Peru, the “Country of the Indians”, there is a great number of tribes, the most important being the Quechua and Aymara. Besides Spanish, Quechua is spoken particularly in the highlands. 48% of the population are Indians, 35% are mestizoes, and 13% are white. The capital is Lima. When Pizarro and his soldiers conquered the country, they brought with them their religion, to which all the Indians had to submit. Above all in rural areas, Catholicism mingled with ancient Inca customs. Only in the 19th century, after the Colonial Wars, did the country slowly open up to evangelical mission work, which, however, was being launched particularly in the 20th century. That’s also the time when our partnering union was born, the ‘Convención Evangélica Bautista del Perú’ (CEBP).